Jennings Peak , a sub-summit of Sandwich Mountain, is worthy of a trip in itself. 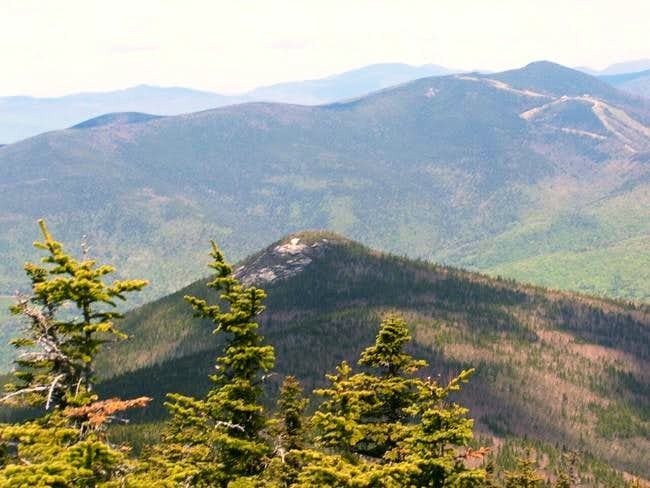 What make Jennings Peak stand out from Sandwich Mountain is the fact that Jennings Peak has an amazing view north toward Sandwich Mountain Some often take a trip to to just Jennings itself for the great views. Jennings Peak can be reached by either the Class 1-2 Sandwich Mountain Trail or the Class 1 Drakes Brook Trail. The Sandwich Mountain Trail Begins with river crossing that can be dangerous after heavy rainstorm or during spring melting season . Use caution hear as well as just before the trail summits Noon Peak where one Class 2 highly eroded pitch lies. The Drakes Brook Trail also has a similiar dangerous brook crossings. Use caution on this section after a heavy rainstorm or during spring melting season. The trail is very level towards the beginning and never start climbing until well into the trail. The moderate to steep section (still class 1) is when the trail turns away from the brook. Both trails can be used as a low with the Sandwich Mountain Trail as the ascending trail and Drakes Brook Trail as the descending trail. Caution: Both the Sandwich Mountain and Drakes Brook Trail have dangerous stream crossings in high water. Consider another route if during the spring melting season or after a major rainstorm. On the Sandwich Mountain Trail, Sandwich Mountain can be climb at anytime without added a long trip. However the Algonquin Trail add 3.7 miles one way to the trail length (already 4.5 miles before adding Sandwich Notch Road) due to the closing of Sandwich Notch Road in winter. Drakes Brook Trail would make a great snowshoe trail however due to the fact that it connect to a ski trail, it may require a cross country ski permit. Also in winter the stream crossing can be dangerous in winter if the river hasn't iced over. Jennings Peak can be easily done in day so there is little reason to camp while hiking the mountain. However if you like to do backcountry camping check out the Backcountry Camping Rules in the AMC White Mountain Guide (See Books). Here are two websites that will provided you the best information on conditions on Jennings Peak.